Keeley Kmieciak is a 2016 graduate of the University of Oklahoma. 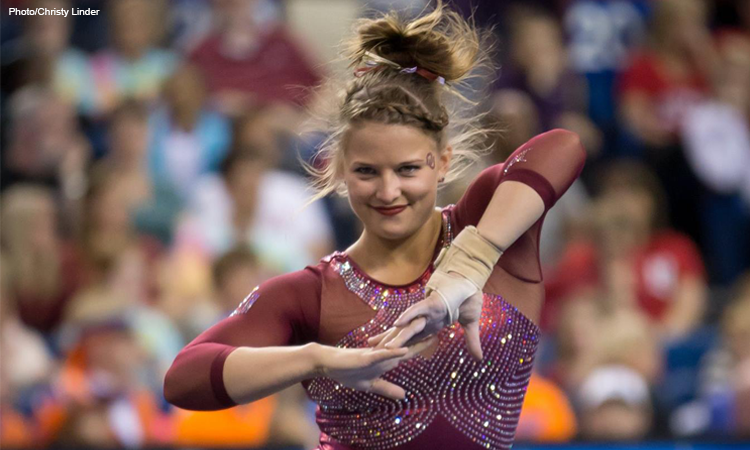 She is a two-time national team champion with the Sooners, including contributing to the team’s first national title. Throughout her career she earned first-team All-American honors on every event and in the all around. She also had career highs over 9.900 on every event, including a 10.000 on bars at the 2016 Big 12 championship. She stayed at Oklahoma after graduation to pursue a master’s degree while working closely with its athletic department. 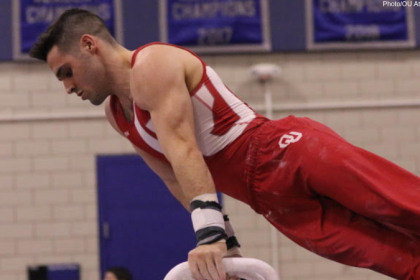 College Gym News: What has your life been like post-gymnastics and post-graduation? Keeley Kmieciak: I went back to school to get my master’s degree in intercollegiate athletic administration. While going to school, I worked as a graduate assistant in the development office for the OU Athletic Department. CGN: You were a member of Oklahoma’s first national championship winning team. What did that moment feel like? KK: It was so surreal. It was a dream come true to be a part of a national championship team. We worked so hard to make that dream a reality, and it was awesome to see all the hard work really paid off! 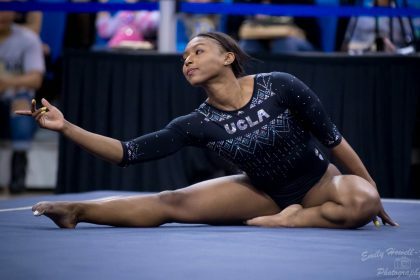 CGN: How have the skills you learned doing gymnastics helped you in your life? 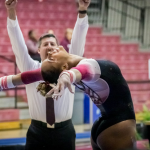 KK: Gymnastics definitely shaped me into the person I am today. It taught me that hard work pays off and that you can do anything you set your mind to. It definitely made me a stronger person. CGN: You’ve been pursuing your master’s degree at Oklahoma. Have you had the opportunity to stay close with the team and/or help in any way? If so, how? KK: I tried to stay involved with the team as much as I could by helping out with the booster club table during home meets. I worked with McKenzie Wofford, and we enjoyed getting to interact with fans before the meets. I try to make it to as many meets as I can! CGN: How have your undergraduate experiences helped you in graduate school and shaped you as a person? KK: Being a student-athlete taught me how to manage my time well. Going into graduate school I was able to take those experiences to help me juggle my 30-hour work week as a graduate assistant and all the work that comes along with school. That skill will help me throughout the rest of my life. CGN: What factors drew you to Oklahoma? KK: The coaching staff was so driven, and I could tell they were passionate about winning their first national championship. The school has such a great academic center, and they truly want their athletes to succeed in school. The first time I walked on campus it felt like home. CGN: What are your goals for the future? What are your career aspirations? KK: I would love to open my own fitness gym in the future. I am so passionate about health and fitness, and I would love to be able to help others with their fitness goals. KK: As much as I loved my time as a gymnast, I don’t see myself working in gymnastics. I will always keep up with OU gymnastics and try to attend as many meets as I can. My little sister is a level 10 gymnast, and I love being able to watch her go through what I went through at her age. 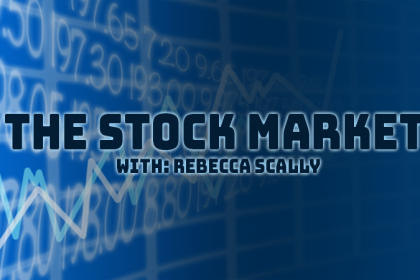 CGN: How has your college experience changed your outlook on life? KK: I don’t think my college experience could have been any better. I met so many amazing people at OU and learned so many life lessons there. I wouldn’t have traded it for anything!